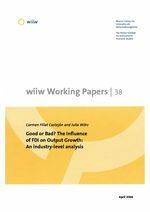 This paper attempts to reconcile the often inconclusive evidence on the impact of FDI on growth by taking into account the heterogeneity both among industries and among countries. Using a comparable database at the industry level for 35 countries of the OECD, Asia and Eastern Europe from 1987 to 2002, we test both the stage of development and the FDI industrial pattern for the economic impact of FDI on growth. In certain industries and for the catching-up countries, a significant and positive relationship emerges when FDI interacts with investment or export orientation.